Now in its fourth season, the success of the “Diner’’ has spawned a live stage show at the Starlite Theatre in Branson, Mo., and Caribbean and Alaskan cruises filled with the quirky characters from the weekly hour-long improvisational television show. Up next: a real diner in Bellevue based on the show. The TV show has its broadcast home on RFD-TV, the linchpin of the Rural Media Group television network based in Omaha, Neb. But its production facilities are at NorthStar Studios off Dickerson Pike. 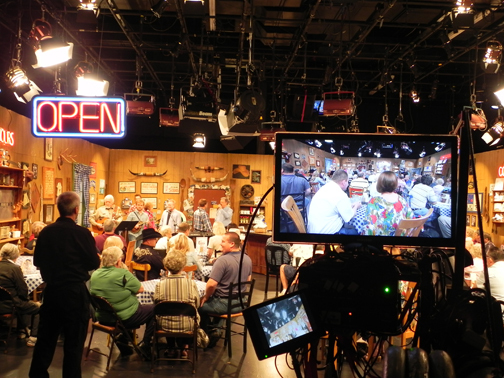 Other properties include Rural TV, FamilyNet, RFD-TV The Magazine and the RFD-TV Theatre in Branson, Mo. The three cable channels reach a combined 62.5 million households. “Larry’s Country Diner,’’ is one of the most popular shows on RFD, with an average audience of 1.4 million monthly. 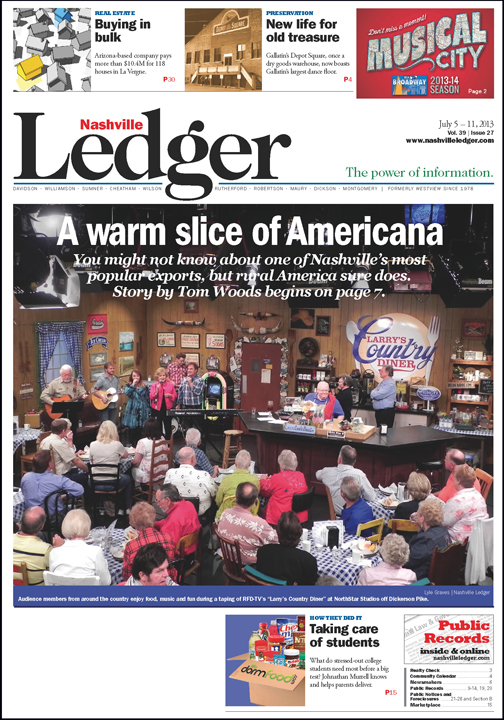 The setting for the TV show is just what the name implies, an old-fashioned country diner where country music legends and current stars just happen to drop by to sing a few songs, chat with a friend, mingle and mill around. Food is served, tall tales are told and sometimes-corn-pone, sometimes-edgy humor abounds. 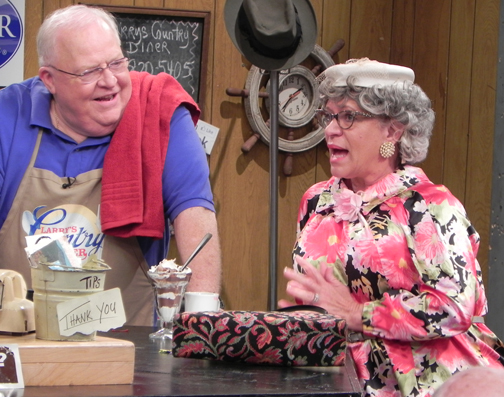 Larry Black, proprietor of “Larry’s Country Diner,” gets an earful from Nadine, one of many characters who have earned a warm spot in the hearts of viewers. It is just the type of friendly gathering place that appeals to the sensibilities of rural-minded Americans, no matter what part of the USA they call home. “Larry Black is the best thing that’s happened to country music in 30 years. He’s keeping country music alive, and that’s what it’s all about,” says Grand Ole Opry star and Hall of Famer Jean Shepard. And so is Jimmy Fortune, now a solo artist since the legendary Statler Brothers retired in 2002. So, if tourists are hunting for the mythical diner, then perhaps one ought to exist. “If they stumble across (the show), and it’s fun, they stay. And they come back the next week. And because of that, we realized that a physical diner would probably work in Nashville,” says Black, 69, a former disc jockey at WSM and movie/television actor. 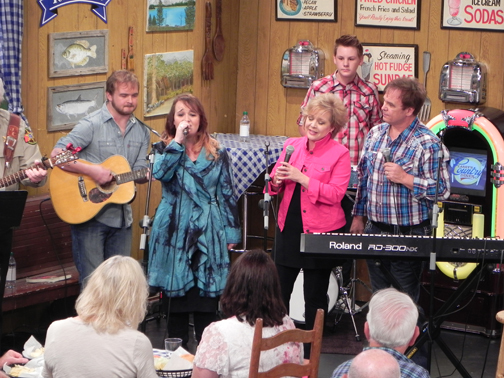 The Jeff and Sheri Easter band, with son Madison on the guitar, daughter Morgan singing and Landan Smith on drums, perform during a recent taping at NorthStar Studios off Dickerson Road. Black is still raising funds, but spent $1.2 million for a 1.3-acre parcel just off Interstate 40 at the Bellevue exit (196) across from Shoney’s. The existing structure has been torn down, and architectural plans for a 140-seat facility have been drawn. There is a billboard touting the property as the diner’s future home, but a construction date has not been set, although there is a target date. Renae Johnson, the vice-president of operations at Gabriel Communications – but better known to the show’s faithful as the white-haired, Renae the Waitress – can’t wait for groundbreaking. “Instead of shovels, we’re going to be out there with a huge fork and spoon. It’s gonna be great,” she says. “We’re excited about the possibility of being able to build the thing. I think it will become a destination point,” says Black, who in December 2012 was named an Ambassador Good Will for Tennessee. The feeling on the set before and during taping is essentially the same, unscripted banter between cast members, and the audience enjoying pie and iced tea. Longtime restaurateur Charlie McCabe, who currently operates the PaSgetti’s restaurant in Bellevue and whose family owned the Loveless Café until 2003, will be the meat-and-three’s manager. It may not look or feel like one, but in its simplest form, “Larry’s Country Diner’’ is a talk show. Black had been producing the “Country’s Family Reunion Roadshow,’’ videos since 1997 and decided he’d like to try a talk show when friend Ralph Emery decided to end his interview show on RFD. “So I saw that there was an opening, and I’d always wanted to do an interview show,” Black says. “When I was on in the mornings on WSM, that was fun. I always enjoyed talking to people and learning about them. “But I hated the thought of doing a couch thing behind a desk, fireplace sitting in the background, sitting in easy chairs, all the conventional talk show kinds of things. I just didn’t like that. “So I conceptualized, ‘Gee, wouldn’t it be nice if there was this little Podunksville diner someplace, stuck in Anywhere USA, and the local cable company needed programming at lunch time. So they would just send the camera crew in, and they’d just film people having lunch. “And it was interesting that this particular town had a sheriff who was a world-class guitar player. And he’s shows up every day for lunch. And if a star dropped by, which they always did, then he’d get his guitar out of the patrol car and play with them. Fans of Larry’s Country Diner television show can buy personalized bricks for display in the real Bellevue diner’s “Legacy Walkway,” but it isn’t cheap. The red cement bricks range in cost and size from $300 (8x4) to $500 (8x8) to $1,000 (12x12). Information: larryscountrydiner.com/brickorder, 1-800 820-5405. “All of it is unscripted,’’ says Black. “I have no idea what Nadine’s going to do when she’s out there. And she’s out there five to seven minutes, and I have no idea what she’s going to say. “Sometimes [announcer] Keith [Bilbrey] will do a fun fact, sometimes we will do something from the mailbag, a letter, but the rest of the time we’re just flying by the seat of our pants. And that makes it fun. That’s what I enjoy. And it’s not just regular folks who are tuning in. “The most interesting social tweet we’ve had was from Drew Carey, the host of “The Price is Right.’’ Drew Carey tweeted one night, ‘I’m watching “Larry’s Country Diner,’’ and trying to figure it out.’ And I go, ‘That’s cool.’ You never know who’s watching. Black says the show is not a money-maker. Advertising has continued to grow, but the show is financially underwritten by Black’s videos. “I didn’t know how long it would last. I just wanted to do it, not knowing if it would take off,” he says. “From a financial standpoint, it was risky at best. It was like going into a casino and putting all your money on the 11 and hoping it’s going to hit, because then it pays 35 to one. Unlike the national networks ABC, CBS, Fox and NBC, which pay for shows to be produced, air time is usually bought by the producers on cable networks like RFD. “It’s interesting. When you talk to people, the first thing they want to know is how you get on RFD if you’re a country person. And I tell them you have to have a good, strong budget,” Black explains. “You can be on television if you want to be on television, if you’re willing to pay the freight. We’ve always had to buy television time. Black says the annual budget for “Diner,’’ is about $700,000. They tape 26 episodes a year and each airs twice. Tapings are done each February, June, August and December at NorthStar Studios off Dickerson Pike. “When you break it down, it looks a little more feasible. But it’s an expensive show to do,” Black adds, pulling out a calculator and tapping in numbers. “So it’s like $13,000 a show. “Then that is a number you can work with, because we have eight minutes worth of commercial air time in the show. “There are four two-minute commercials, so if I divide that by eight, a commercial to break even, just to pay the costs, for a 60-second commercial is $1,682 (per episode). Then you can come close to making your budget. Gus Arendale, owner of Springer Mountain Farms Chicken, was brought on board as an advertiser this season by longtime friend Shepard. Randy Little, who owns PFI western wear (Boot Daddy brand) and operates the Starlite Theatre in Branson, has known Black for nearly four decades since their college days in Springfield, Mo. “Larry’s a couple of years older than I am, so I listened to the radio station [when Black was a disc jockey] on a little AM transistor radio. And over the years, we just kind of followed each other,” Little says. “And he invited me down to his show and that’s kind of how we started. “And I became a sponsor, and then also partners in the Starlite Theatre. So now we’re taking “Larry’s Country Diner’’ on a road show to the Starlite Theatre.